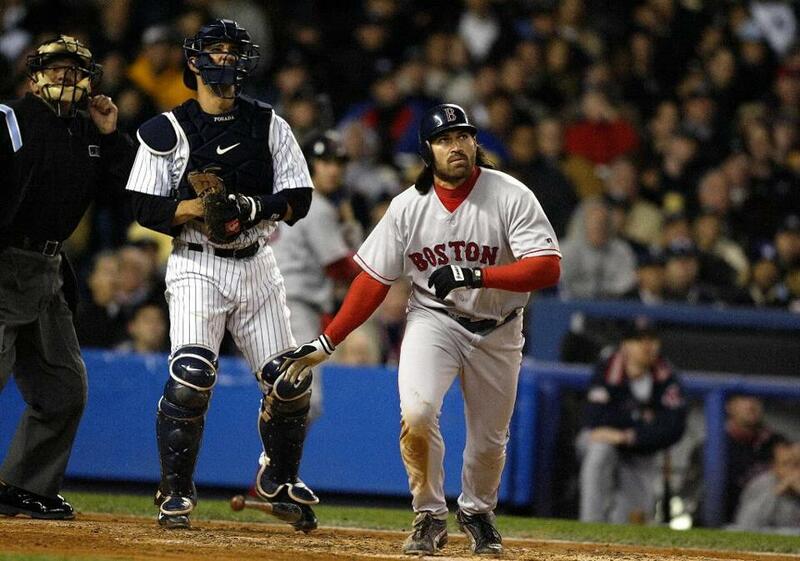 This grand slam by Johnny Damon in Game 7 of the ALCS helped the Red Sox bury the Yankees. Forget all that Cowboy Up stuff of the 2003 season. So passe, said Johnny Damon, as the Red Sox entered the American League Division Series against the Angels. The 2004 postseason Red Sox, according to the adept center fielder/leadoff hitter, should no longer be known for their boots ‘n’ stirrups, but rather for a more cerebral something. Over the course of four days, beginning Oct. 5 in Anaheim, the Angels succumbed to the Boston brain drain, swept in three games by scores of 9-3, 8-3, and 8-6. The Sox outpitched, outbelted, outran, and, yes, outthought the Sons of Gene Autry, sweeping a postseason series for only the second time (they swept Oakland, 3-0, in the 1975 ALCS). The crowning shot came in the 10th inning of Game 3, at the Fens, when designated hitter David Ortiz lashed into a fat ‘n’ juicy Jarrod Washburn slider and sent it soaring over the Wall for a series-clinching, two-run homer. For the 12th time in three games, the Sox got their leadoff man on base (a Damon single off reliever Francisco Rodriguez), setting the stage for Ortiz’s memorable clout. “It was a slider left a little bit high, and here we are,” said a jubilant Ortiz, drenched in champagne suds inside the Sox’ clubhouse when it was over. Washburn was the starter in Game 1 at Anaheim and lasted only into the fourth inning, a frame in which the Sox piled up seven runs -- their biggest one-inning explosion in postseason history. Kevin Millar had a two-run homer and Manny Ramirez a three-run blast, making for a relatively easy afternoon for Sox starter/workhorse Curt Schilling (6 2/3 innings, 3 runs). On what was an otherwise carefree day for the Sox, the only notable blemish was the sight of a hobbled Schilling, hunkered over at the first base line, massaging his painful right ankle after fielding a grounder. “A tweak,” reported Sox skipper Terry Francona. Pedro Martinez, the club’s faltering ace who lost his final four starts of the regular season, opted not to attend the news conference for starting pitchers the day before his Game 2 start. “I’ll talk after I pitch,” said Martinez. “People now, they can write whatever they want.” Martinez had grown somewhat distant over the last month of the regular season, his game faltering, a pair of losses to the Yankees a particular source of frustration. “Call the Yankees my daddy,” he said after the second loss to the Bombers in September. When Game 2 was complete, the proud Martinez (7 innings, 3 runs, 2 walks, 116 pitches) had shown signs of the dominant Cy Young Award winner of old, and the Sox were 8-3 winners. Jason Varitek nailed a Bartolo Colon fastball for a two-run homer to tie it, 3-3, in the sixth, and a Ramirez sacrifice fly in the seventh scored Damon with the go-ahead run. A ninth-inning explosion, highlighted by a Trot Nixon RBI single and a bases-clearing double by Orlando Cabrera, had the Angels on the brink of elimination. Bronson Arroyo, the stringy, cornrowed righthander, started Game 3 and pitched into the seventh with a 6-1 lead, yielding to the bullpen for what looked like easy work. But before the inning was over, Vladimir Guerrero tied it with a grand slam off Mike Timlin, the Halos’ MVP candidate drilling a 92 mile-per-hour heater into the bullpen. Derek Lowe, the demoted starter, picked up for Keith Foulke in the 10th, and pitched out of a pickle with runners at the corners, setting the stage for the Ortiz fireworks. When the monster DH’s shot slipped into the Monster seats, the all-but-forgotten Lowe had an unlikely `W’ next to his name, and the Sox had a ticket to the American League Championship Series. Over in the Angels’ clubhouse, the mood was of admiring resignation. David Eckstein thought the same. ”As long as they can get the Yankees out of their heads,” he said.